Few studies differentiate between major and minor complications. The complication rates range from 0% to greater than 20% (Table 4) (5,33,38,57). Major complications seen with laparoscopic Burch include bladder injury, ureteral damage or kinking, abscess or seroma formation in the space of Retzius, failed procedure requiring additional surgery, de novo detrusor instability, new onset intrinsic sphincter deficiency, urinary retention, voiding dysfunction, and a possible increase in posterior compartment prolapse (87). Speights et al. (89) reported a 2.3% lower urinary tract injury rate in 171 patients. The four injuries were inadvertent cystotomies, two following prior Marshall-Marchetti-Krantz and staple-mesh procedures. All occurred in the dome of the bladder and were repaired laparoscopically intraoperatively. There were no ureteral injuries. The authors pointed out that this injury rate was lower than the 10% injury rate observed in an open Burch colposuspension series (90). A French center (91) reported a 3% injury rate in 104 laparoscopic Burch procedures, two cystotomies and one partial ureteral transaction. Ferland and Rosenblatt (21) reported ureteral obstruction in two postoperative patients. 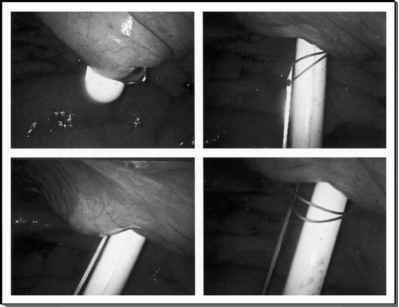 Cystoscopy revealed a transmural passage of suture anterior and lateral to the urethral orifice in one patient and puckering and lateral displacement of the right trigone, causing ureteral obstruction in the second patient. Both these injuries were on the patient's right side, similar to other reports (92,93). Ferland suggested that when the surgeon stands on the patient's left side, suture placement tends to be lateral-to-medial with the right-sided sutures, increasing the risk of entrapment of the right bladder wall and intramural ureter (Fig. 4). To prevent this complication which is not seen on the left side because the natural suture placement is medial-to-lateral away from the bladder for a right handed surgeon, he recommended passing the right sutures medial-to-lateral (Fig. 5). Dwyer et al. (93) reported three cases of bladder sutures and three cases of ureteral obstructions by suture in 178 patients, with an overall lower urinary tract injury rate of 3.4%. Cooper et al. (38) reported on 10 cystotomies and 1 bladder suture in 113 patients, resulting in a 9.7% lower urinary tract injury rate. The overall laparoscopic injury rate for the lower urinary tract in all gynecologic cases ranges from 0.02% to 1.7%, which is not different from that seen with open gynecologic cases. The higher incidence of inadvertent cystotomies reported in some series were usually in patients with prior surgery in the space of Retzius and were bladder dome injuries easily recognized and repaired at the time of surgery. It is essential that intraopertive cystoscopy be performed to identify occult bladder and ureteral injuries in all major urogynecologic procedures. Abbreviations: LSC, laparoscopic Barch; TVT, transvaginal tape; NS, not significant; P prospecture. FIGURE 5 ■ A safer suture technique goes medial to lateral avoiding the bladder. Source: From Ref. 21. FIGURE 4 ■ Lateral to medial placement of the bladder neck suture increases the chance of catching the bladder wall and kinking the ureter. Source: From Ref. 21.
detrusor instability. This has not been clearly demonstrated. In over 300 cases, our de novo detrusor instability rate following laparoscopic Burch has been 8% (Ross, unpublished data, 2004). Several published series report no significant voiding dysfunction with laparoscopic Burch (6,10,37,40). Lavin et al. (70) found significantly less subjective voiding dysfunction after two years in laparoscopic versus open Burch, 16% and 52%, respectively. Su et al. (71) reported 4.3% voiding dysfunction in both laparoscopic and open Burch. No long-term follow-up studies are available. We have as many as 20% of our patients report positional changes in order to empty their bladders in the first six months following laparoscopic Burch, usually with resolution by the end of the first year. Routine bladder ultrasounds in our clinic have not demonstrated significant problems with increased postvoid residue. The majority of studies have found less blood loss with laparoscopic Burch (22,70,71,73). Earlier, spontaneous voiding compared to other procedures has been reported in several studies (22,71,99). Decreased length of stay in the hospital has been reported in almost all of the laparoscopic studies (73). Abdominal wall vascular injury is usually secondary to lateral trocar placement, resulting in inferior epigastric vessel damage (8). The reported incidence is 0.5% and it is reported to be less frequent with cone-shaped or blunt trocars (0%) as compared to sharp-cutting ones (0.83%) (100). Major bleeding, requiring transfusion, has been reported after injury to abdominal wall vessels (101). A major advantage of laparoscopic surgery is the significantly lower ventral hernia formation (100). Most hernias that develop at trocar sites are due to lack of closure and are entirely preventable. The majority of these hernias are extraumbilical and the contents are usually small bowel (Richter hernia) (84.2%) and, less often, colon and omentum (102). Margossian et al. 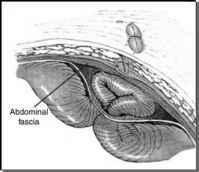 (103) reported a preperitoneal herniation of the terminal ileum through the right lateral 10-mm port in which the fascia had been closed, but not the muscle and peritoneum (Fig. 6). We had a similar experience with a left 10-mm trocar site. To prevent this complication, it is necessary to close the peritoneum, muscle, and fascia at large trocar sites. Several companies have simple devices to use for this purposeg and it adds very little time to the operative procedure (Fig. 7). A rare complication reported during laparoscopy is postoperative acute ischemic necrosis of the small bowel. Hasson et al. (104) reported a case of a 34-year-old woman who underwent extensive adhesiolysis and myolysis and was readmitted with an acute abdomen 48 hours after discharge. At laparotomy, the patient had acute peritonitis, extensive adhesions, and a 3-cm perforation in the small bowel. Tissue examination of the resected bowel showed ischemic necrosis. Seven of eight patients with this diagnosis died. None of these patient's surgeries took longer than 1.4 hours. These cases reported in this series were described as elective, routine, uneventful, or without apparent complications at the time of surgery. The possible pathophysiology could stem from gInlet Closure, Inlet Medical, Inc., Eden Prairie, MN; Endoclose, U.S. Surgical Corp., Norwalk, CT; Storz Reuseable Fascial Closure, Karl Storz, Culver City, CA. FIGURE 6 ■ Small bowel herniated through an unclosed peritoneal defect. Source: From Ref. 102. FIGURE 7 ■ It is important to close fascia, muscle, and peritoneum; especially at large trocar sites. Source: From Ref. 102. Walter et al. report minimal differences in complications, blood loss, operative time, hemoglobin change, hospitalization, or hospital charges between open and laparoscopic Burch. CO2 pneumoperitoneum, which can cause decreased cardiac output due to increased systemic resistance, decreased venous return, and elevated intrathoracic pressure. It can potentially cause reduction in splanchnic blood flow, resulting from mechanical compression of mesenteric veins, humoral vasoconstriction of mesenteric vessels, and increased portal venous pressure caused by absorption of CO2 and increased release of vasopressin. These effects can lead to mesenteric thrombosis, resulting in infarction of small bowel. Atherosclerosis, dense adhesions, or congenital stenosis can trigger these mechanisms. Hasson et al. suggest prevention is better than treatment in handling this catastrophic complication and recommend not letting the intra-abdominal pressure exceed 15 mmHg and periodically decompressing the pneumoperitoneum. This reien-forces the adage that a patient should typically get better each day following laparo-scopic surgery, and even small setbacks require immediate action.